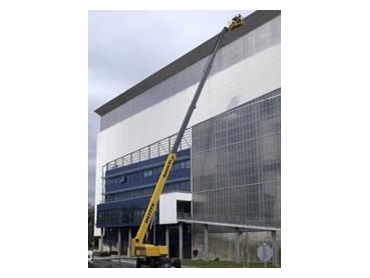 Haulotte Group is getting in on the action with its big booms, the H 43 TPX 43 m telescopic platform and the HA 41 PX articulating platform, which will appear at BAUMA 2007 on stand no. 1005/3 – Exterior Zone F 10. Designed to meet all working requirements at heights of 41 and 43m, the H 43 TPX and HA 41 PX platforms are loaded with features. With both booms and fly jib range (140°), the HA 41 PX and the H 43 TPX can be used for many purposes: building sites, shipbuilding and the port industry, chemistry, petrochemistry, aeronautic industry. Offering maximum safety, the HA 41 PX and the H 43 TPX big booms respond to the demands of the latest labour regulations, to European (EC marking, EN 280) and also international standards (ANSI, CSA, AS …).